CAPT. JOHN D. DONNELL. The gentleman whose sketch now claims our attention has passed from the stage of life, but his memory is dear to his surviving friends, and a record of the prominent people who have made Bond County what it now is would not be complete without a notice of his life. John D. Donnell was born in Guilford County, N. C., September 8, 1817, and was brought to this county by his parents (see sketch of family history in life of William Donnell, of Greenville) when he was only three years old. The trip was made by wagon in the usual emigrant fashion. He was sent to the country log schoolhouse, with its primitive arrangements for accommodation of the pupils, and within its walls were to be found many children who have since made their names known in the public affairs of the State. By them this modest temple of learning is remembered with affection and the instruction received there has aided them in their advancement. After his early life there, our subject attended a good school in Hillsboro, Ill., for one year. 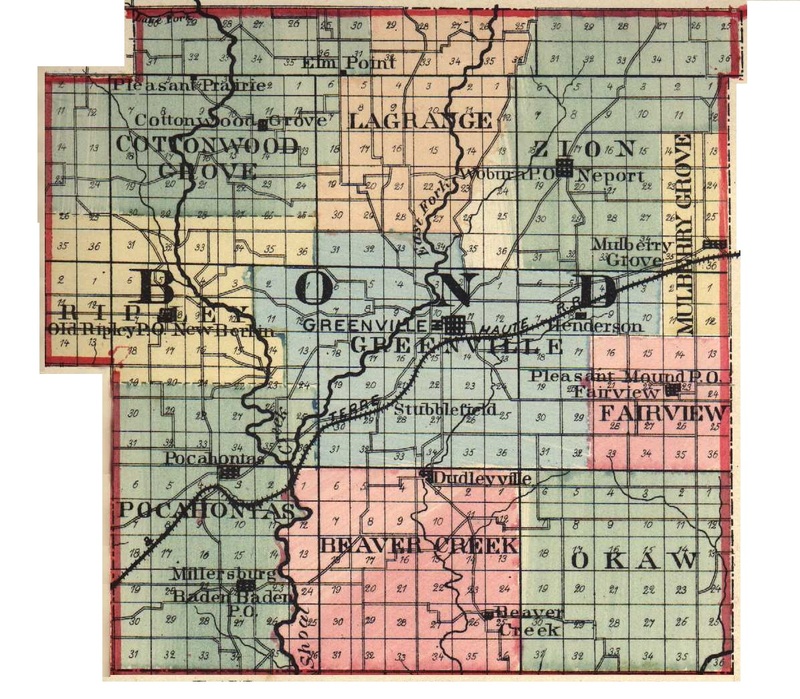 At that time the land in Bond County was unimproved and the deer and wolves were still numerous. Occasionally, our subject went upon hunting expeditious, but life was busy then and he had to work hard without many play days. When he had reached man's estate, he decided to found a home of his own and chose Miss Ann R. Robinson to become his wife. She was born in this county, December 18, 1822, and her marriage took place June 15, 1843, when she was twenty-one years old. Four children blessed this union: Edwin is now married and resides in Salida, Colo.; William J. is at home unmarried; Ann Elizabeth married Daniel Hair and is deceased, and Charles D. died in infancy. The father of Mrs. Donnell was Gideon Robinson, a native of North Carolina, who came to this State in 1819, in an emigrant wagon a prairie schooner as it was later called. Mr. Robinson entered land in Central Township and built a log cabin in the woods, where he developed a large farm. He died at the age of sixty years. In his political belief, he was a firm Whig. The mother of Mrs. Donnell was Rachel Craig, a native of Tennessee, and four children were reared by her, William T., James P., Mary B. and Ann. Her death occurred when she was about sixty years old. She was a member of the Methodist Church, and a good, kind, Christian woman. After marriage, our subject and his wife settled upon this farm in a snug three-roomed house and immediately began making improvements upon the place. Into this happy household, the rude clarion of war sounded, and the husband and father shouldered his musket to do battle for his country. The enlistment of Capt. Donnell as a private in the One Hundred and Thirtieth Illinois Regiment took place in August, 1862. He was promoted until he reached the rank of Captain, and served until December, 1864, when, on account of rheumatism, he was forced to resign. Capt. Donnell was with Gen. Sherman in his campaigns and fought in the battle of Vicksburg. After his return from the army, he remained at home until the following summer, when he and his brother crossed the plains with an ox-team to Denver. At the time of his decease, Capt. Donnell owned about five hundred acres of land. His death occurred December 18, 1872. Since that sad event, Mrs. Donnell and her sons have managed the farm and have been very successful in the work. Capt. 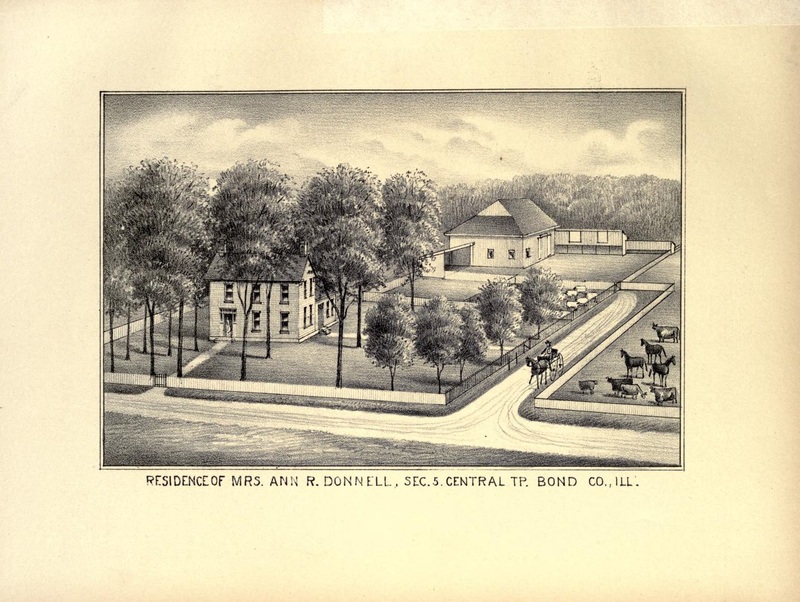 Donnell was a member, with his wife, of the Presbyterian Church and gave of his means to its support. In politics, he was a Republican and upheld all things which seemed right in his sight. His good business qualities resulted in his acquiring wealth and particularly was he fortunate in the buying and shipping of cattle. He did a large business in that line in 1806, when he bought in Kansas and sold at other points. Extracted 04 Dec 2016 by Norma Hass from 1892 Portrait and Biographical Record of Montgomery and Bond Counties, Illinois, pages 202-205.